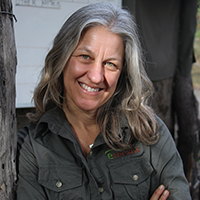 Dr. Amanda Stronza presents "Conflict and Coexistence: A Story of People and Elephants in the Okavango" on Friday, March 29, 10 a.m. – 11 a.m. EST in Duke University's Field Auditorium in Grainger Hall. In the eastern Okavango Panhandle of Botswana, roughly 18,000 elephants compete with 16,000 people for access to water, food, and land. The elephants are not confined to any park, reserve, or nation. They roam freely, often in places where people are planting fields, herding livestock, and walking their children home from school. Each year during the dry season, the elephants move in large numbers from seasonal pools and woodlands of the north to permanent waters of the Okavango Delta. Along the way, they pass through villages and settlements, using corridors they remember and have followed for generations. Encounters between people and elephants are often dangerous and stressful for both. Elephants raid and trample crops, and people harass or chase elephants and clear land for new farms. Sometimes the encounters result in death, either for elephants, people, or both. In 2012, a team of researchers joined with community leaders in the Okavango to form Ecoexist, a non-profit organization focused on finding solutions to human-elephant conflict. The presentation will feature stories of how the team is finding ways for people and elephants to coexist in one shared landscape. Dr. Stronza is an anthropologist, professor, and photographer with nearly 30 years of conservation experience in the Amazon, the Okavango Delta, and other parts of the tropics. She directs the Applied Biodiversity Science Program at Texas A&M University, and she is a co-founder of Ecoexist, a non-profit organization in Botswana, focused on fostering coexistence between people and elephants. Friday, March 29, 2019 - 10 a.m. to 11 a.m.